The ostrich or common ostrich (Struthio camelus) is either one or two species of large flightless birds native to Africa, the only living member(s) of the genus Struthio, which is in the ratite family. Some analyses indicate that the Somali ostrich may be better considered a full species separate from the Common Ostrich, but most taxonomists consider it to be a subspecies. The ostrich shares the order Struthioniformes with the kiwis, emus, rheas, and cassowaries. However, phylogenetic studies have shown that it is the basal extant member of Palaeognathae and is thus equally closely related to flighted tinamous. It is distinctive in its appearance, with a long neck and legs, and can run at up to about 70 km/h (43 mph), the fastest land speed of any bird. The ostrich is the largest living species of bird and lays the largest eggs of any living bird (extinct elephant birds of Madagascar and the giant moa of New Zealand laid larger eggs). The ostrich’s diet consists mainly of plant matter, though it also eats invertebrates. It lives in nomadic groups of 5 to 50 birds. 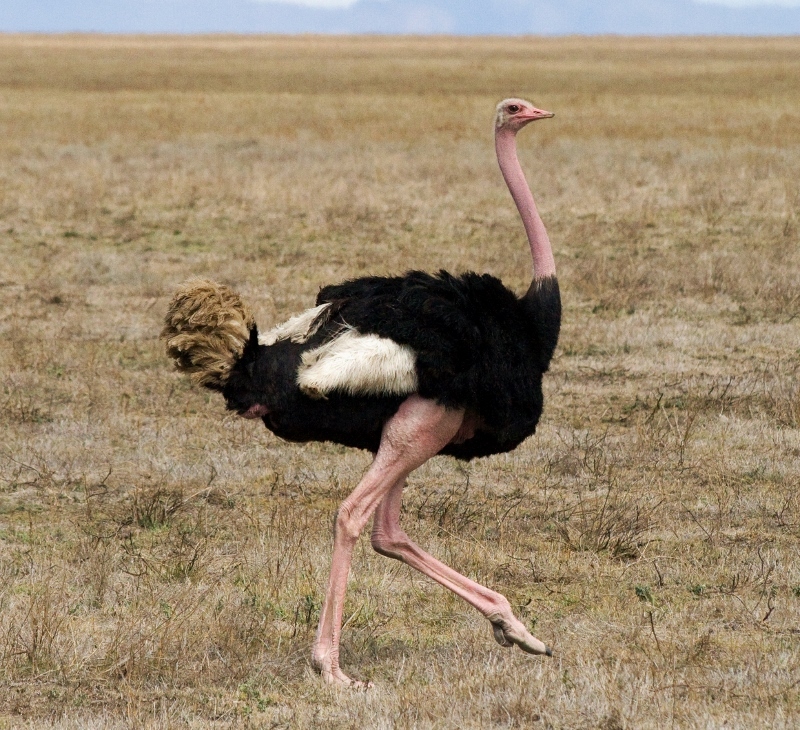 When threatened, the ostrich will either hide itself by lying flat against the ground, or run away. If cornered, it can attack with a kick of its powerful legs. Mating patterns differ by geographical region, but territorial males fight for a harem of two to seven females.